So, an app based game from a popular TV show about a man’s experience of the sci-fi convention circuit is fun? Well, yeah. 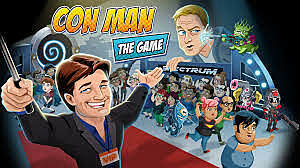 Con Man The Game is a great little iOS and Android game, where you play as the convention manager. Your most important task is building and developing your convention, and also ensuring toilets don’t leak, and the rubbish bins don’t overflow! 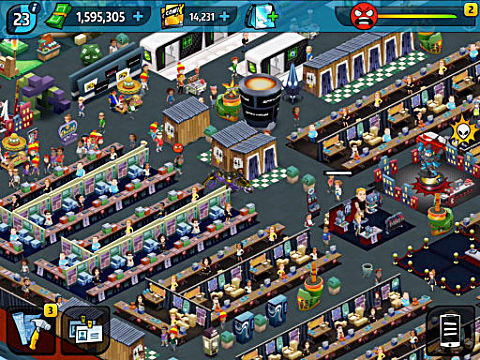 Building merchandise stalls, food booths and exhibition stands earn you cold hard cash and XP. XP allows you to level up, for access to better, more luxurious stalls, toilets and bins for your convention, paid for with in-game currency. Once you’ve unlocked, for example, the basic and medium level toilets, for 30,000, you can then unlock and purchase the luxury toilets with swimming swans on the roof! Expanding your convention gives you more space for larger exhibits and for more visitors, thus helping you generate more cash. Balancing your con-bligations for improving facilities with expanding the convention, alongside adding new and larger exhibitions is good. Importantly, a fair distribution of themes, such as sci-fi, horror, fantasy and superhero is essential to maximise attendees. So we like people to be all smiles, spending their money, taking selfies with the VIP’s and partying with Wray, ie. the perfect convention. But sometimes things go wrong, toilets break, bins become full, nudy Judy arrives running riot and Con Crud makes everyone vomit. You hire staff, and assign them to complete these tasks, the number of staff available increases as you level up. 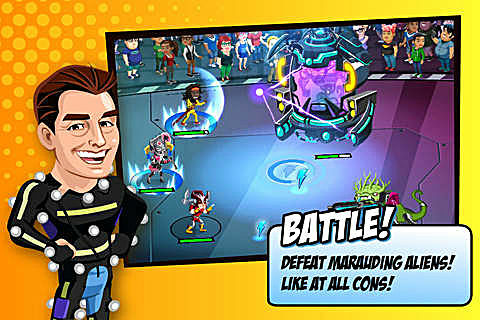 Alien invasions are fun, your ‘super fans’, such as Lord of the Seth go into battle against aliens in a timed combat system, during combat you ensure your heroes can attack aliens, defend against alien attacks and power up for super attacks. Successful alien attacks lead to stalls burning for a little while. Con Man The Game gives you tasks to complete, such as ‘resolve x number of tasks’ or ‘squash x number of vermin’ and completing these tasks rewards you with XP or cash. It is worth completing these, but they are ultimately just an added extra. Once every so often, the stalls will generate a con bag, which is a big bag of a mixture of XP, cash, Comix and unique items, including buffs, such as a tree or a lamp that generate extra cash and XP for your stalls. Comix are a good way of speeding up the tasks, and unlike premium currency in other games these sorts of items are fairly easy to come by. There are a number of VIP’s paid for by Comix that can reduce the amount of waste or toilet trips, but these VIP’s only last for a short time. It is reasonably easy, at a decent level for the ‘bad things’ not to bother you, as the timed tasks can be finished in less than 1 minute for no cost to you. I think spending Comix to complete tasks is actually a good idea, as it’s more important to be using them to speed up tasks than anything else. Sometimes ‘The fairy has a message’ -- for all those who despise adverts and I’m one of them, this is the only game where I will choose to watch the advert, as it does generate free Comix and buffs for less than 30 seconds of your time. Generally, this is a super fun game, nothing heavy or taxing, but I do think some of the mechanics could be improved. 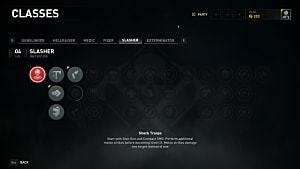 For example, the hype meter is not as important as it should be; your convention still earns cash and XP when people are unhappy, so it seems insignificant as there is no real consequence when people are annoyed. There are some tasks that are disproportionately timed, such as catching nudy Judy, which dramatically increases visitor’s dissatisfaction disproportionately, and it increases too quickly afterwards. Also, once you’ve had an alien attack, it’s time to call the game a day, as a second visit will be more likely, when you’ll be fighting with weakened heroes. On that note, set things up, like toilet fixing and bin clearing as the game works in real time. The flip side of that is a large exhibit area takes actual days to build which is a little frustrating, but does give you a realistic scale of the overall build. 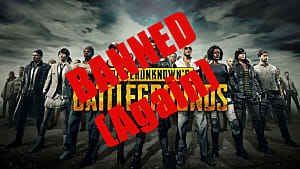 Like most freemium games, it is fairly shallow and lacks any real depth, so is best played in shorts bursts. Unfortunately, there is nothing to entertain you for a long play session, but playing in short bursts keeps the game fun. 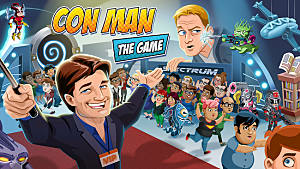 Con Man The Game is free with in-app purchases, and was released on August 25th 2016. It can be downloaded for iOS via iTunes or Android via Google Play. I played the game on iOS on my iPad. Tudyk and Fillion are Coming to a Mobile Device Near You!